Ubertooth - An Open Source Bluetooth Test Tool download ! This project was originally unveiled at the recently concluded ShmooCon. It shows a lot of promise and the authors two years of study and experimentation. The name is Ubertooth. Ubertooth is an open source 2.4 GHz wireless development platform suitable for passive bluetooth monitoring. It aims to be the world’s first open source and affordable bluetooth monitoring and development platform. In reality, the commercial equivalents of such tools are available for 10000$ and above! 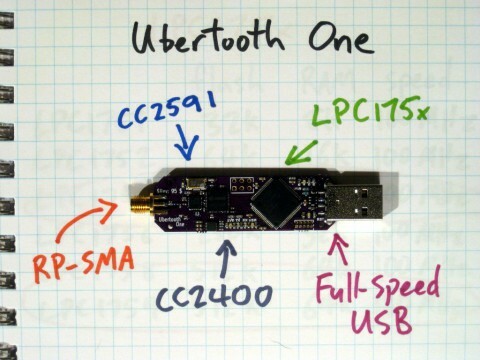 Ubertooth Zero: It was a low power (comparable to a Class 3 bluetooth device) USB dongle, and the first working prototype hardware platform of Project Ubertooth. It has since been superseded by Ubertooth One. Ubertooth One: It is a smaller, higher power (comparable to a Class 1 bluetooth device) USB dongle and is the next generation hardware platform of Project Ubertooth. It supersedes Ubertooth Zero and is currently the preferred platform. RP-SMA RF connector: connects to test equipment, antenna, or dummy load. LPC175x ARM Cortex-M3 microcontroller with Full-Speed USB 2.0. USB A plug: Connects to host computer running Kismet or other host code. Unfortunately, the Ubertooth hardware architecture is not compatible with bluetooth Enhanced Data Rate (EDR) modulations. However, EDR packets begin with a Basic Rate (1 Mbps GFSK) header. So Ubertooth could be used for identification and partial monitoring of EDR transmissions. But, worry not, with time and MONEY, this shortcoming could well be overcome. How? The author has launched a KickStarter project and needs your support. This will end on the 28th of February 2011. You can even get yourselves a completely assembled copy of Ubertooth One! Download the software part of Ubertooth One here.